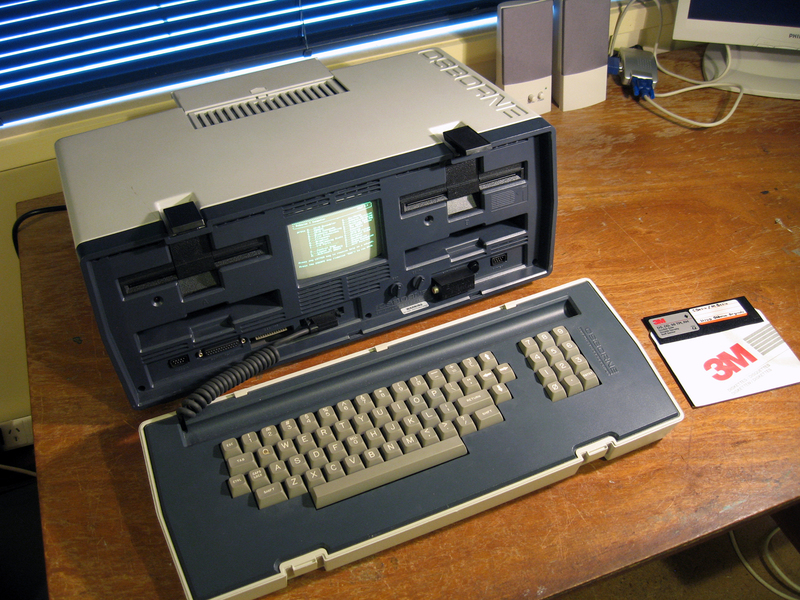 Released in 1981, the Osborne was one of the first computers designed for the busy executive on the go. It was also good for building biceps. This Z80-driven, CP/M "luggable" was one of the first complete microcomputer business packages. By this I mean a full head of 8-bit Z80 RAM (64k), a useable full-stroke keyboard, two disk drives and the full library of business software. You got everything you would probably ever need with one purchase. One feature of interest is the screen. It's a tiny 5 inch 24 line x 52 characters. I wonder how many cases of user eye strain and migraines this caused? It's remarkably clear for such small characters though. I remember seeing ads for this computer when it first came out. I really wanted one, primarily because it was portable. In these days of laptops, smartphones and tablets we take it for granted that computers can go with us but that was not the case back then. Mobility was a real novelty. It had that wow factor! This ugly old beast shown in the photo is the second Osborne 1 I've owned. The first one was purchased in September 2007 off an auction site complete with original manual and software disks. It was the first vintage computer I bought after deciding to start a collection. It didn't bode well for my new hobby when five minutes after I turned it on there was a loud bang and smoke started to pour out the disk drives! I opened it up and found blown capacitors in the power supply, presumably from non-use after all these years. Luckily these were easily fixed. The troubles didn't end there though, as it then simply refused to boot. After some experimentation I found the cause. A faulty RAM chip. This was replaced with a spare chip (socketed) from one of my parts-only System 80s. Luckily the latter used exactly the same RAM. It's all documented here. Even after all that it was still cantankerous and would lock up on occasions after 30 minutes or so of continuous use! Also drive B started playing up. This problem was also found and fixed. In 2010 I acquired the one above for free. This one had a video adaptor for an external composite monitor and it was in better condition that the first one. The latter was passed to another proud owner. Although (or perhaps because) it looks positively Jurassic, I love this old computer. It's caused me work at times, but the Osborne 1a is one of the more treasured computers in my collection.